The mPhone 7 Plus is one of the most powerful and stylish smart phone devices that introduced by mPhone to the world smart phone market. This device has a fingerprint sensor on the back of it is quick responsive and unlock the phone in less than 0.3 Sec. The mphone is powered by 1.5GHz octa-core MediaTek MT6750T 64bit and it comes with 4GB of RAM. The phone packs 64GB of internal storage which is expandable up to 128GB. As far as the cameras are concerned, the mphone 7 plus packs a 16-megapixel primary camera on the rear and a 13-megapixel front shooter for selfies. The mphone 7 Plus runs Android 6.0.1 Marshmallow and is powered by a 3000mAh non removable battery. It measures 144mmx72mmx8.5mm and weight 154.00 grams. The mphone 7 Plus is a dual SIM (GSM and GSM) smartphone that accepts Micro-SIM and Nano-SIM. Connectivity options include Wi-Fi, GPS, Bluetooth, NFC, USB OTG, FM, 3G and 4G (with support for Band 40 used by some LTE networks in India). Sensors on the phone include Compass Magnetometer, Proximity sensor, Accelerometer, Ambient light sensor and Gyroscope. The mPhone 7 Plus is one of the most powerful and stylish smart phone devices that introduced by mPhone to the world smart phone market. This device has a fingerprint sensor on the back of it is quick responsive and unlock the phone in less than 0.3 Sec. 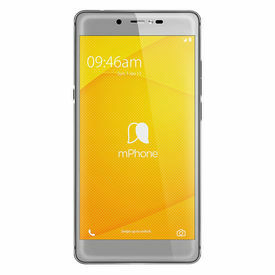 The mphone is powered by 1.5GHz octa-core MediaTek MT6750T 64bit and it comes with 4GB of RAM. The phone packs 64GB of internal storage which is expandable up to 128GB. As far as the cameras are concerned, the mphone 7 plus packs a 16-megapixel primary camera on the rear and a 13-megapixel front shooter for selfies. The mphone 7 Plus runs Android 6.0.1 Marshmallow and is powered by a 3000mAh non removable battery. It measures 144mmx72mmx8.5mm and weight 154.00 grams. The mphone 7 Plus is a dual SIM (GSM and GSM) smartphone that accepts Micro-SIM and Nano-SIM. Connectivity options include Wi-Fi, GPS, Bluetooth, NFC, USB OTG, FM, 3G and 4G (with support for Band 40 used by some LTE networks in India). Sensors on the phone include Compass Magnetometer, Proximity sensor, Accelerometer, Ambient light sensor and Gyroscope.